A venogram of the upper limb venous drainage at the thoraic inlet helps to delineate venous anatomy and helps guide the access method. It also helps prepare against surprises such as venous obstructions or anomalies. 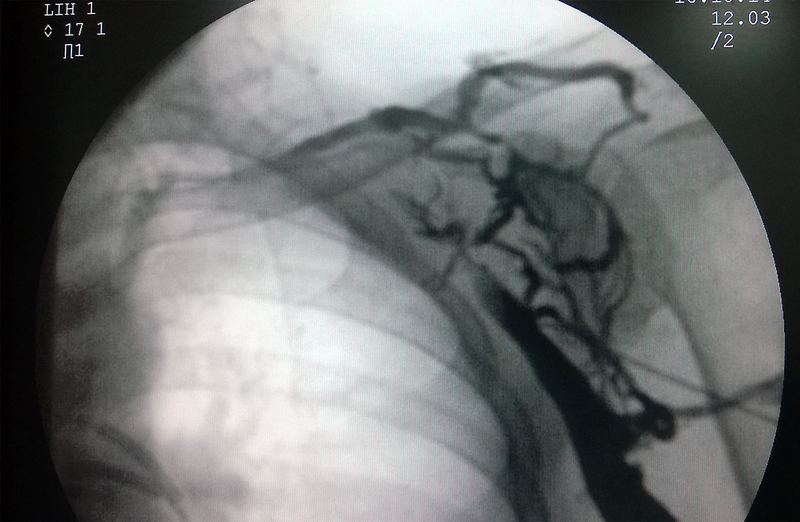 A venogram entails injecting contrast material to an ipsliateral forearm vein and recording its flow proximally via fluoroscopy. About 10 ml of contrast media diluted in normal saline to fill a 20 cc syringe is used to opacify the vein. Its injection is followed by a flush of saline to clear the vein of contrast as contrast is an irritant (especially if hyperosmolar types are used). Diluted contrast is sufficient as fine details of the vein are unnecessary – only a rough outline of the veins are necessary. 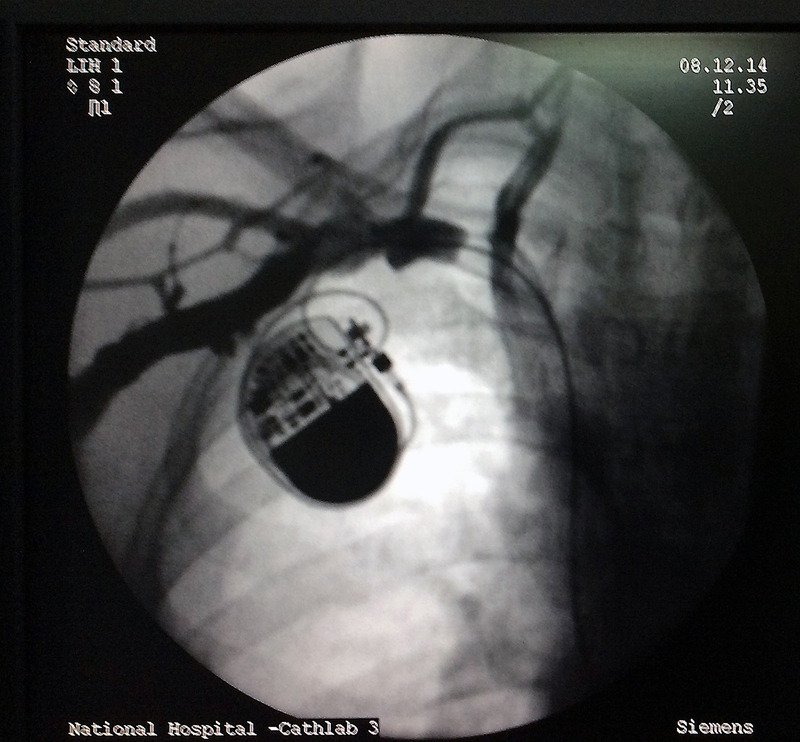 In modern systems, fluoroscopic recording (fluro-grab) is sufficient at 3- 5 fps with moderate level of exposure. Cine imaging is not necessary. Also note that all recordings are done in AP view. Once a venogram has been done and the vessel is noted to be patent, the operator should strive to achieve the puncture as far as possible from the clavicle (i.e. the extra-thoracic approach) as the vein is now clearly visible and that fact should be made use of. where surface landmarks are not palpable or clearly visible. 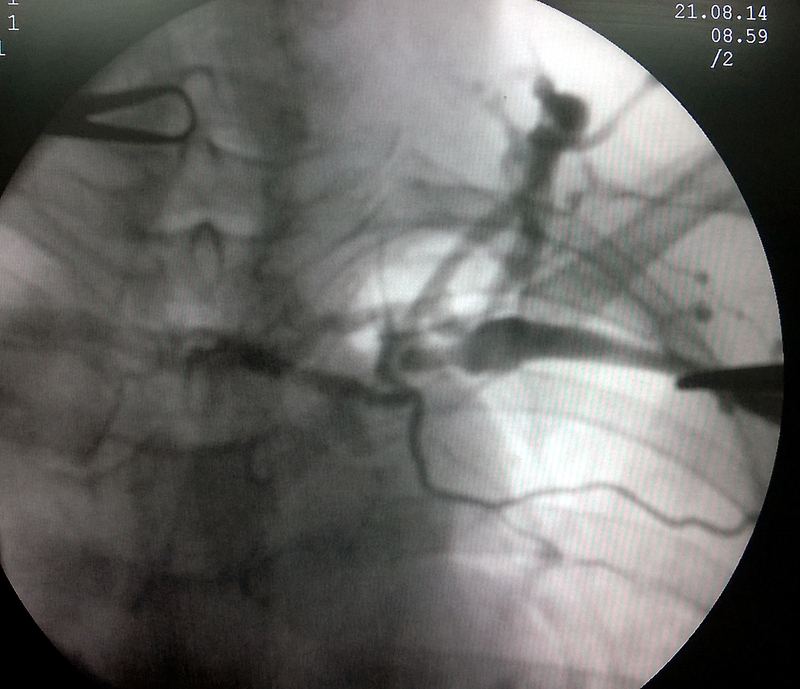 Unrecognized but potentially present problem is venous spasm after venography – although the vein looks large on the fluoroscope – by the time the needle puncture is attempted, the vein would have collapsed under spasm and the operator would not know it – if this is suspected, a slow, diluted injection of 50 micrograms of GTN can relieve the spasm.